Tritec’s skills cover the complete range of electronics hardware design services. Our experienced hardware designers use simulation tools to optimize and prove designs, with system modeling and circuit proofing before commitment of design to prototyping. Best practice and in-house gained knowledge then ensure that your product has the best opportunity of achieving electromagnetic compatibility during its compliance testing – negating the need for multiple test submissions and hence a quicker time to market. For those clients wishing to take their product to market we offer in house manufacturing and technical product support. Alternatively we always supply a comprehensive manufacturing package for any clients who want to manufacture elsewhere. Tritec have skilled and experienced analogue Design Engineers with a wealth of broad ranging experience. With today’s vast array of embedded solutions we are able to bring product concepts to reality in very short timescales. Embedded microprocessor designs enable fast to market and configurable cost effective solutions to many design problems. Digitising analogue signals allows complex signal processing to be achieved at relatively low cost and with high accuracy and speed. Tritec support many vendor technologies to achieve optimum design, which include NXP, Microchip, Intel, Altera, Xilinx to name but a few. Our experienced software developers work closely with our Digital and Analogue Design Engineers to achieve the best and most cost effective solutions to our customers design requirements. We have a wealth of experience with many of the 8, 16 and 32-bit Microcontrollers on the market. We utilize FPGA’s in some of our designs when we need real-time specific functions such as when performing image processing. It is important to realize the association of circuit design with PCB design as parasitic elements in the physical PCB must be taken into account during the early phase of the design. PCB Layout is one of the most important factors affecting EMC performance. We utilize Altium CAD Software for Schematic Circuit & PCB Design. This professional tool allows Tritec Engineers to produce designs that are seamlessly integrated into our 3D mechanical designs. We have extensive in house managed and checked library parts and continually append these with new ones. We closely liaise with our customers to provide exacting solutions to their requirements. 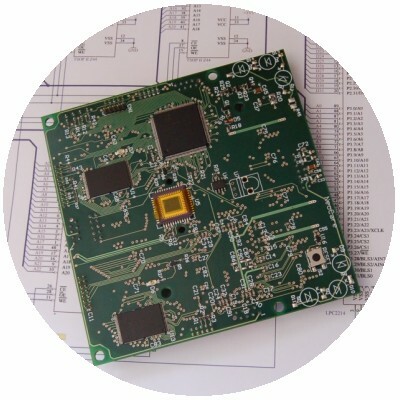 We can produce fully populated and tested prototype boards through to final production issue ones. Tritec have extensive knowledge & many years experience of assisting companies to gain CE approvals for its products. Our design experience enables us to use best practice techniques to avoid many re-tests to gain necessary approvals. We work closely with our local UKAS Notified Body to achieve certification of EMC, ATEX & EU Radio Equipment Certifications.